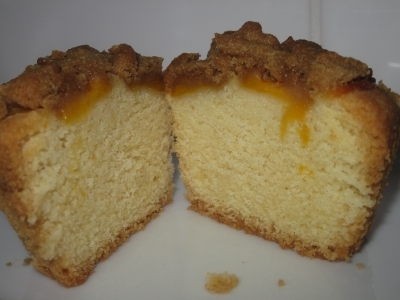 This Peach Cake Recipe is really delicious. The streusel topping turns this easy peach cupcake recipe into a fantastic dessert cupcake. Most cupcake recipes can be made as cakes as well and this is definitely one of them. This recipe makes up a delightful cake that is best made in a spring form tin. Beat butter and sugar in a mixing bowl with electric mixer until light and fluffy. In another bowl combine the flour, baking powder, and salt. Slowly beat the dry ingredients into the creamed mixture until well blended. Spread the batter into cupcake trays. Slice the peaches and arrange over the batter, pressing lightly, overlapping as needed so that the top of the cupcake is well covered with peach slices. Sprinkle topping over the peaches and bake for 20 minutes or until cupcakes are golden brown and the peaches are soft. Note: This is a very stiff mixture but makes a moist, light cake.